I was rereading about what Nisut (AUS) commented on Eclipses, and I was also talking about Djehuty on a German discussion board. And I had some alternate thoughts on the lunar Eclipse. I was wondering if this makes any sense to you. When we take the "vizier of Ra" story as the base. As in: When Ra drew back from the humans and had Nut lift him into the sky, he made Djehuty his vizier and vice king. Therefore one can see the moon as the vizier of the sun. When the sun is away at night, the moon takes over and gives light and watches over us and is a guardian of Maat. Now, astronomically, the moon is always in direct contact with the sun light. Even at New Moon the moon is being lit up by the sun, it's just that we cannot see it from the earth. So, would it make sense to say that Djehuty is always "on duty"? 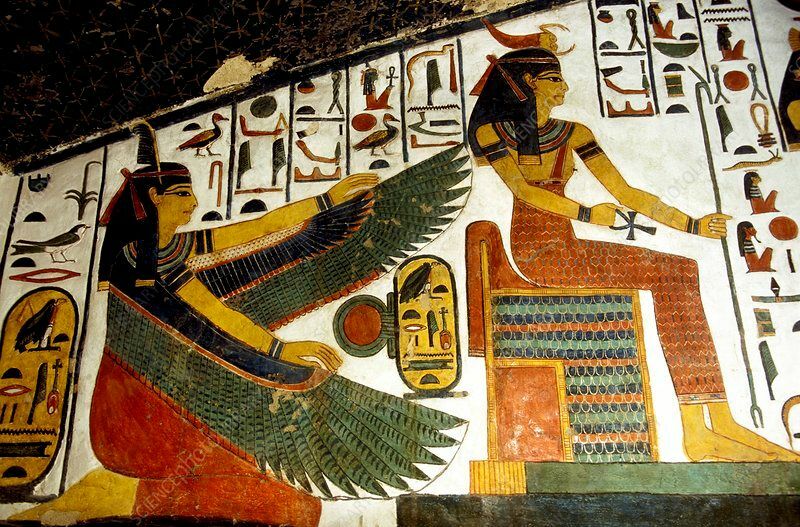 As in, always in contact with his king and receiving sun light, always in the sky around the earth, always watching over and guarding Maat as Djehuty. Also, reflecting light back to us and lighting up the night sky according to his phase. The lunar eclipse, however, cuts the strings of this duty. Because what happens? - The moon enters into the shadow of the earth. For a few minutes, he is cut off from the sun. Bad for Maat, and a dangerous moment, as it is outside of the regular rules and the established system. BUT: Isn't Djehuty a trickster, too? One who sometimes ventures far from the light, since he seeks and gains access to hidden knowledge? One who is known to love mischief and who now and again bends the rules to suit his goals? Cut off from the sun, he suddenly has this moment outside of duty, outside the system. Outside of time? Instead, he is now in the shadow of Geb, the Earth. The oldest of the Kings, a God of a great fertility. And on his other side, the dark depths of cosmos. Nun, containing all the potential of pre-creation. I absolutely love your interpretation of this! Thank you so much for sharing! I have had so many thoughts and feelings leading up to this day, but they have mostly been UPG. Your interpretation on the eclipse meshes rather well with what I have been feeling! This is such a nice interpretation of this! I've been watching the moon slowly shift to a red like hue wondering what something like this could mean in a Kemetic sense. This is a really nice way to think about it, and it definitely gets me thinking. 1.) Set's misbehaviour, specifically in His form of the voracious Black Boar (or beneficial behaviour to the extreme and violent). 2.) A/pep "overtaking" and then being beaten-back, which then requires some "restablishing Ma'at" ritual activity. 3.) Heru-Khenty(-n)-Irty doing some slaying in the darkness, being Master of Navigating/Cutting His way through the Darkness, and together with His four offspring otherwise very punitive toward what threatens Wesir (Wesir also being a sometimes-Lunar Divinity). I also practice Mesopotamian religions secondarily, and in all such instances, Namburbi rituals to dispel the evil of these ill-omens are called for. There's really no positive interpretation of these astral "irregularities" (though scientifically, of course, we know these are rare but perfectly normal occurrences -- but the purposes of these rituals aren't a matter of material science). What a neat and beautiful story!! Thank you so much for sharing it; I love hearing about modern re-interpretations of our myths.